After breakfast, we will visit one of the local traditional market where you can find fantastic bargains of souvenirs and local interests. After that, you may try the famous Indonesian traditional massage (optional). Moreover, you will be given free time to explore one of the most visited place by the youngsters “Merdeka Walk” that is located directly across Medan City Hall where a lot of local favorite food and cafes can be found or you can shop at one of our malls in medan before transfer to Medan Kuala Namu International Airport for your return flight. DAY 1 : MEDAN – TEBING TINGGI – PARAPAT (L,D) ⇒"Upon arrival at Kuala Namu International airport, then transfer to local restaurant for lunch. Continue the journey to Parapat / Lake Toba, drive along the beautiful road which offers the endless view of rubber , palm oil , cocoa plantations and paddy fields . Stop at Pematang Siantar to buy some local snacks : ting ting , teng teng , kerupuk / crackers etc . Check in to hotel and dinner in Parapat . Evening walk and shopping souvenir in Parapat". DAY 2 : PARAPAT - SAMOSIR ISLAND TOUR – MEDAN (B,L,D) ⇒"After breakfast at hotel , Samosir island tour by boat : visit Tomok kampung to see the Batak King’s tombs / Raja Sidabutar and Ambarita kampung to see the traditional Batak village with the stone court and the execution place / Raja Sialagan .After lunch in Parapat , take the bus ride to Medan . Check in to the hotel and dinner in Medan . 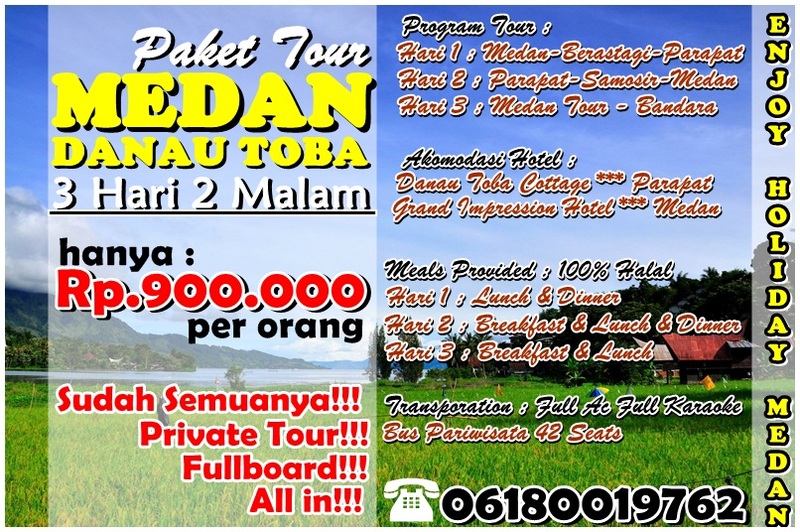 Evening walk / shopping / nite life in MedanOPTIONAL TOUR : CYCLING / BERSEPEDA AROUND BEAUTIFUL SAMOSIR ISLAND." 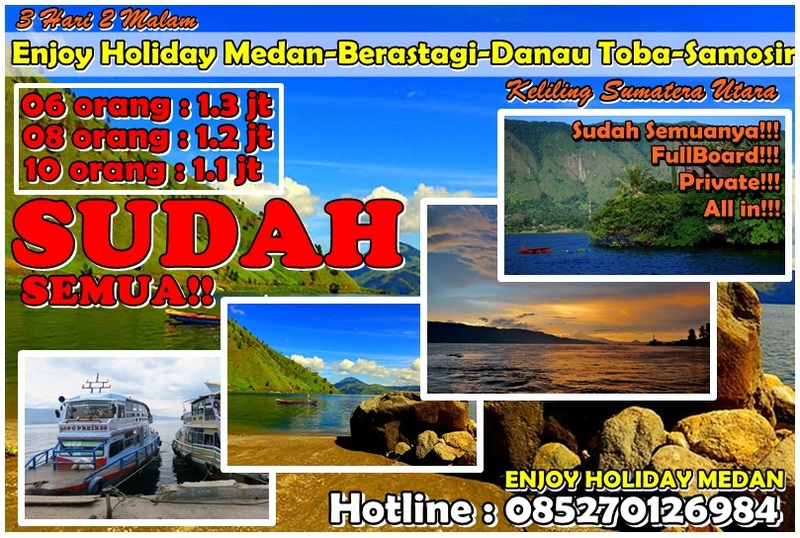 DAY 3: HOTEL – AIRPORT (B) ⇒"Breakfast at hotel , Medan city tour and shopping : visit Istana Maimoon / Sultan Palace, Mesjid Raya / Grand Mosque , Batik house , kedai handbroidery / sulam / telekung etc and Medan Mall / Sun Plaza . Transfer to Medan Airport to fly home with a beautiful memory from Medan / Indonesia."